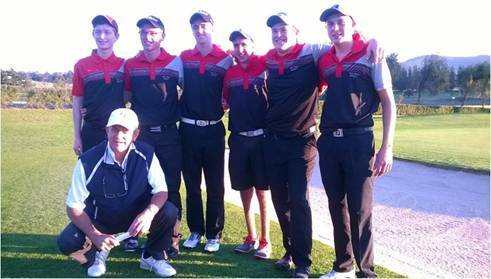 Charl took part in the Interschools for Paul Roos against Grey College from Bloemfontein last weekend at Devonvale GC. He represented his school’s 1st golf team and played one of his best rounds ever. He was playing no 2 for Paul Roos and won his first doubles match play against Grey College. Between Charl and his partner they made 9 birdies and one eagle. They won the match 3&2 of which Charl’s gross score was a personal best of 2 under par 70. In the next match which was a singles match play, Charl was 3 down after 15 holes, but fought back nicely and eventually lost 1 down on the last hole. His opponent was a scratch handicap golfer. Although Charl played some of his best golf for the past year, his School lost against a better team on the day. We are very proud of Charl, who was very competitive against able body opponents, walked and played 36 holes on the Friday without the help of a caddie. The first five players from Grey College, out of 6 players, were all scratch handicap players.